Feel More Relaxed In An Instant!! Everyone has moments when this device could come in handy! Ideal for temporary weight gain, surgery, travel or after a big meal. Just slips over existing button to add one inch. Just slips over existing button to add one inch. 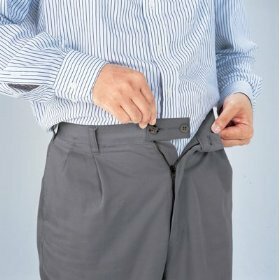 4 Plastic Pants and Skirt Expanders, "The Button" = $11.49 - Free Shipping in U.S.
Popular Order - "The Button" 4 'The Button' Pant and Skirt Expanders and 3 Metal Collar Extenders, $14.00 - Free Shipping in U.S. 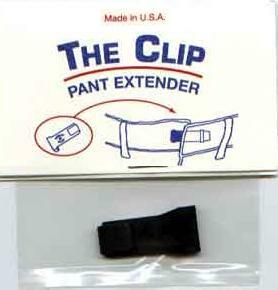 The Clip, Just slips on your Clip button pant to add one inch. Fits in seconds. No sewing required. Hides under your belt. 4 of "The Clip" Pant/Skirt for $11.49 - Free Shipping in U.S. and Worlwide. 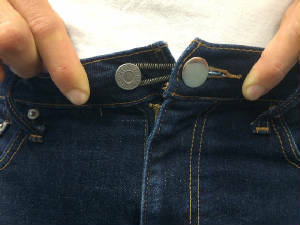 3 Metal Pants/Skirt Expanders and 1 of "The Button" Plastic Pant/Skirt for $11.49 - Free Shipping in U.S. and Internationally.